So I finally am living in a house with a yard again and of course want to get planting right away. But it was important that I start with a strong foundation before anything goes in the ground. 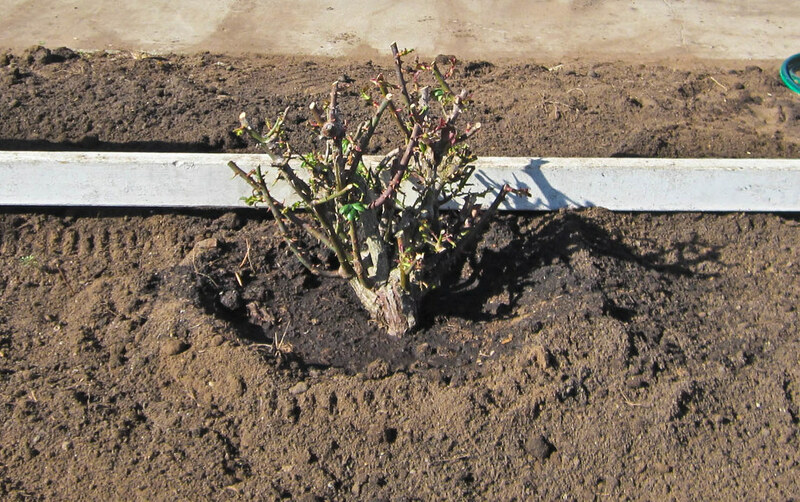 Remove the old shrubs, prepare the soil properly, and do some light hardscaping first. It may seem crazy to do all this work on a rental but I hope to be here for a while and I am able get discounted prices on most of the materials. It is also important to me that I am able to grow the plants that I am designing with and see how they work in this climate so in the scheme of things it seems well worth it. Plus I NEED a garden again. I’ve been too long without one. 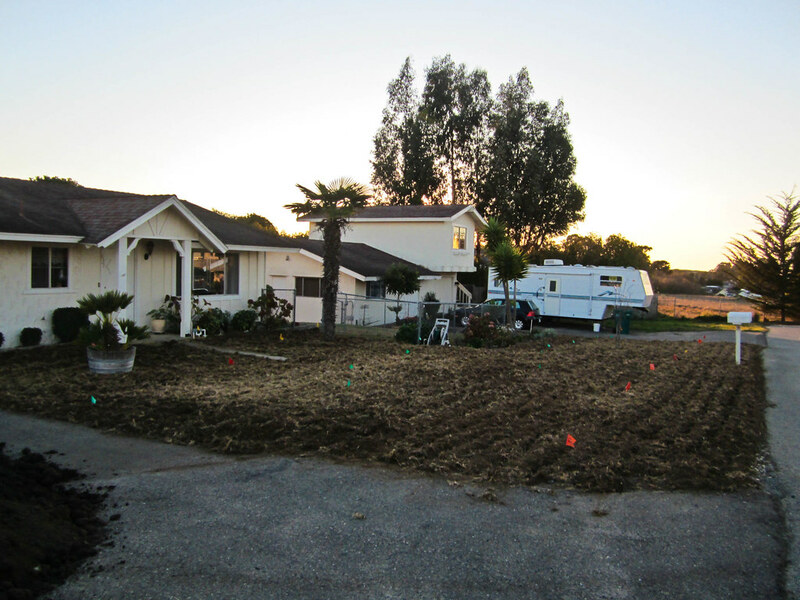 You may remember from last month some of the “before” shots I took of my new Los Osos home. There is also a large side yard to the left of the shot out of frame but for now I am focusing on the front of the house which I will be able to see from the kitchen and living room windows. 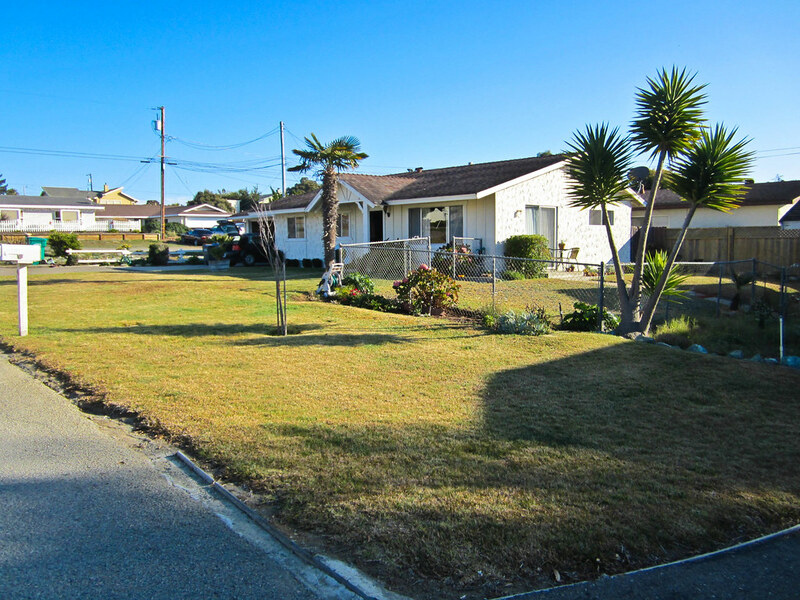 It is a nice sized yard. Seventy feet wide by forty feet deep. I got to work immediately killing the lawn. I did use Roundup which I know won’t be popular with some people but the lawn was Pennisetum clandestinum (kikuyu grass) which is pretty nasty stuff and hard to get rid of. Once the garden gets going I am pretty low tech when it comes to the use of chemicals so I feel like this one time use to replace a lawn with less water thirsty plants is justified. Once the lawn was mostly dead I set about tilling it to break it up a bit. I’m not the strongest person. In fact I am as weak as a baby bird so just getting to this point and I already felt like someone had picked me up and shook me. But I was determined to get it done. I just finished before night fell but I was a mess afterward. If I see that tiller again I will back away while making the sign of the cross and hissing. I was still pretty shaken up the next day but luckily I had helpers. My friend Gabe of Gardens by Gabriel came to offer me his expertise and I hired his employee Victor for the day as well. 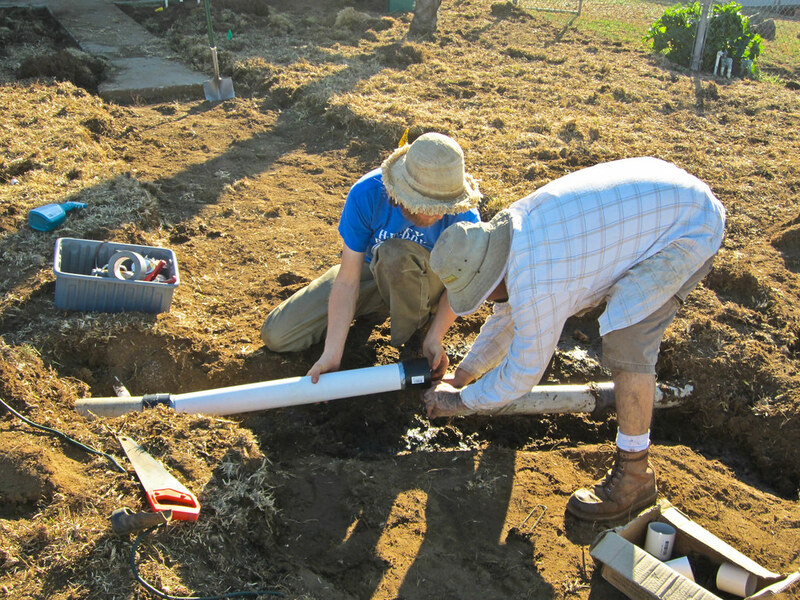 The first task was to prepare the pop up lawn sprinklers for conversion to drip irrigation. The lawn has four zones and thirty(!) sprinklers. We chose one from each zone to act as the converter and the rest were capped. I saved us time before hand by mapping out the entire yard and figuring out which sprinklers belonged to which zone. I also have a fair idea of how I want to divide up the different garden areas which helped us in choosing which ones to cap and which ones to save to create the most efficient irrigation zones. A lot of the heavy lifting was made easier with the Dingo tractor! I cut back this Euryops growing through an Abelia but it still had a huge root mass and was very heavy. The Dingo popped it out in a few seconds. Gabe owns the Dingo but if you are doing a lot of heavy garden work you may want to look into renting equipment like this. The amount of time saved may be worth the money spent. Some old shrubs (like this one) were removed and disposed of but a few others were replanted in other parts of my yard or my landladies yard. The Dingo has several different fittings for different jobs. Aside from the fork used to dig out the plants it has this bucket for digging and lifting. The path from my front door abruptly and weirdly ends about half way to the street so I am continuing the path with large (very heavy) 2 x 2 cement pavers. If we didn’t have the Dingo we would have had to dig out the path by hand. 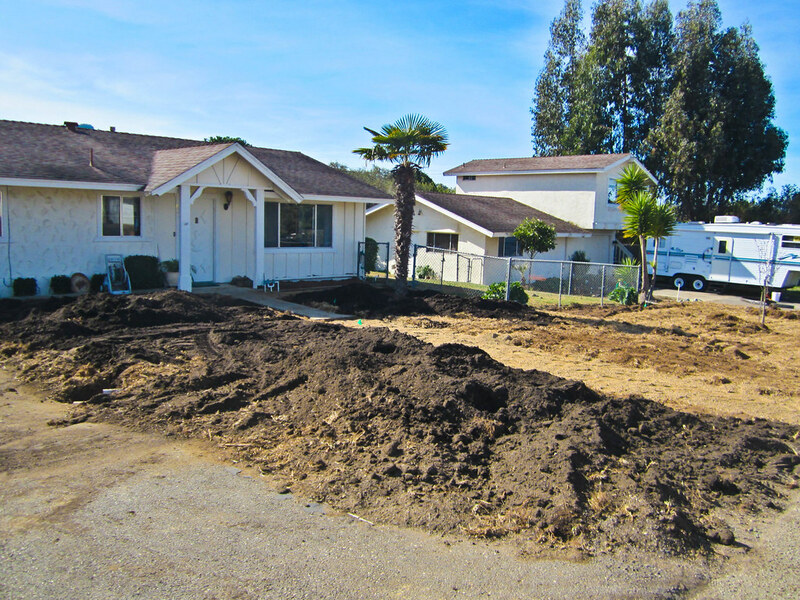 The clumps of dead grass and soil that were removed will be used as a base to create berms to add interest to the flower beds. 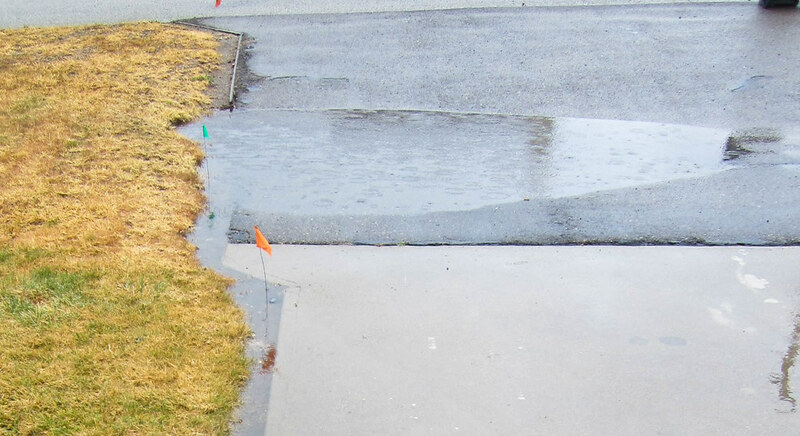 There are some drainage pipes at the edge of the driveway that lead away from the house but as you can see they are clogged and I had a bit of flooding in last weeks storms. I wouldn’t want this to get any worse as our winter rain can be very heavy at times (not this year so far but last year was crazy). So the drainage pipes were dug up and the mud and sediment flushed out of them. 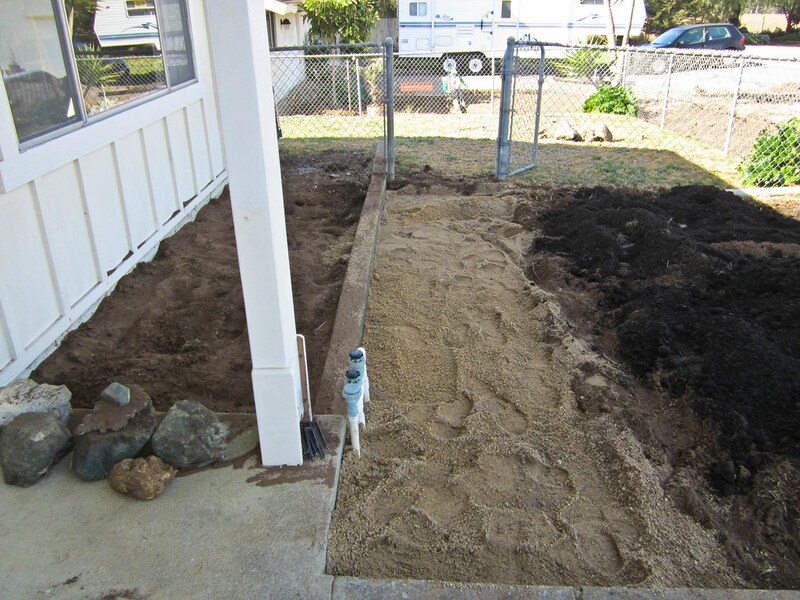 We’ll fill in this area with gravel to provide some more drainage so the water doesn’t pool on the surface. 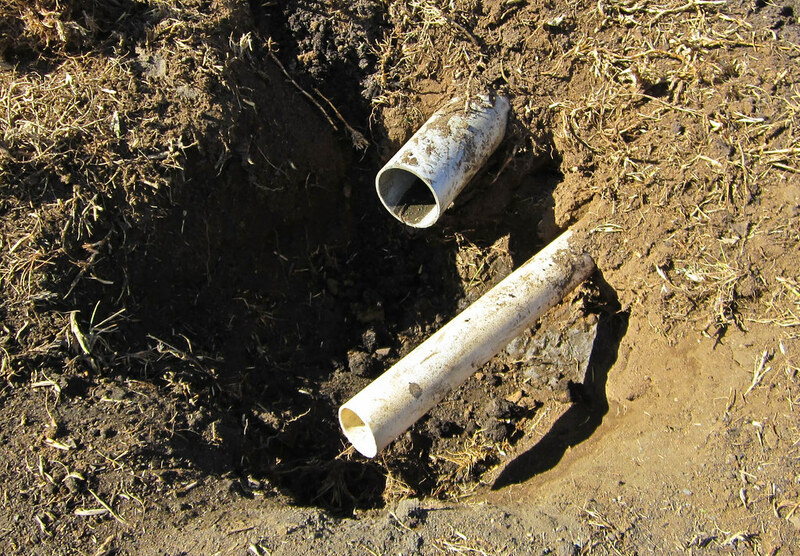 The pipes were old and cracked and full of debris so after they were flushed leaks were found and repaired. 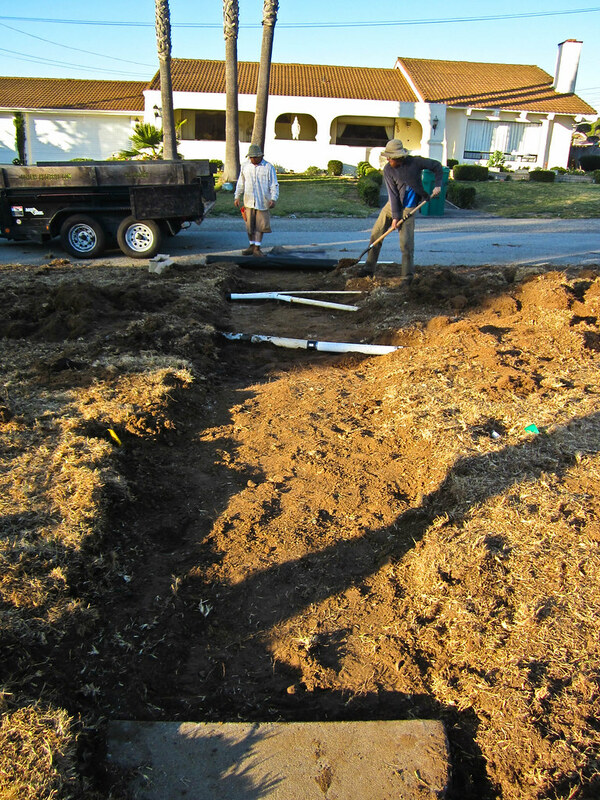 Here is a clearer shot of the new path dug out with the drainage and irrigation pipes running across it. This is the sort of job I could have never done without the expertise of Gabe and Victor. Remember I’m just the plant guy. I have a lot to learn when it comes to this sort of stuff. 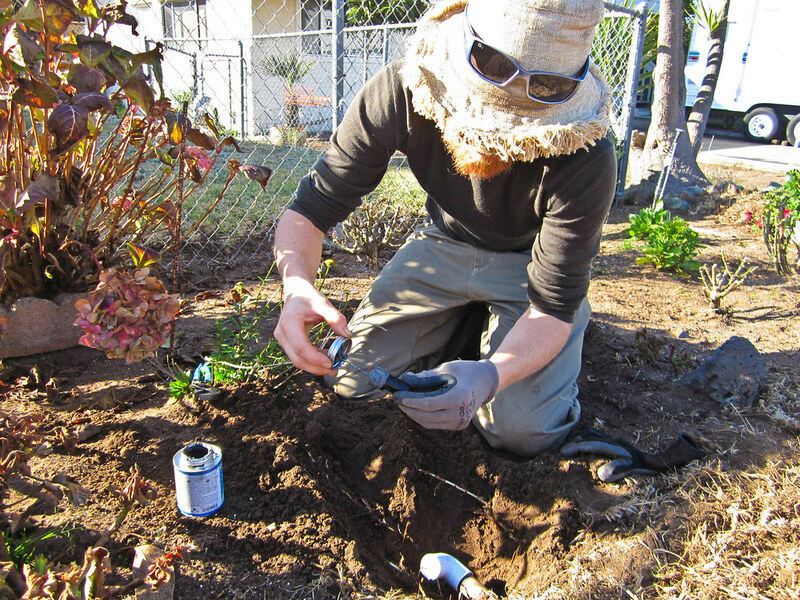 It isn’t as much fun but it is important to get it right for a successful trouble-free garden. 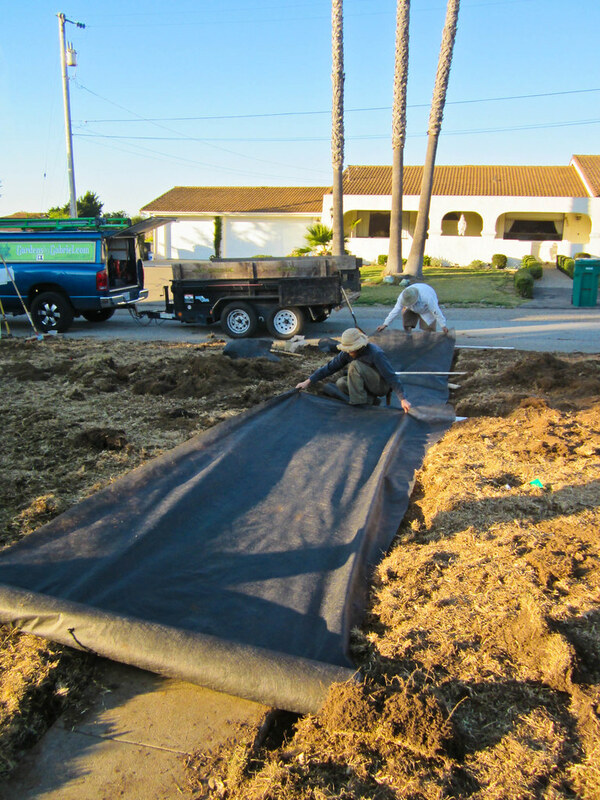 A base of landscape cloth is laid out to keep the sandy soil from rising up and shifting the pavers. All laid out and pinned down and ready for some top dressing. 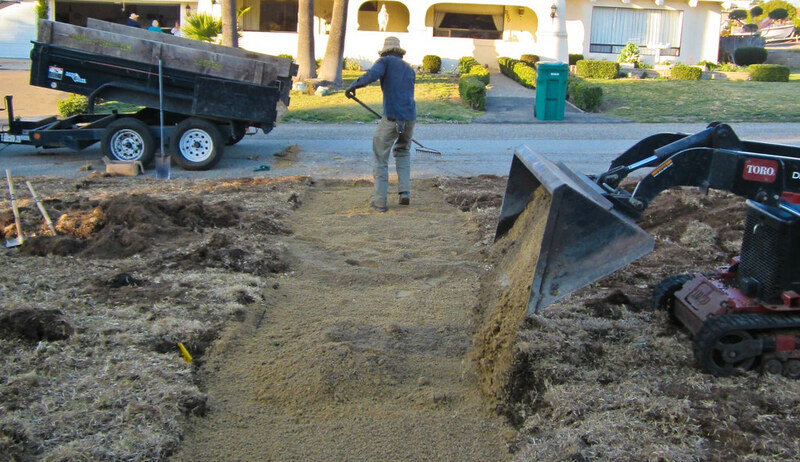 The pavers will rest on a base of decomposed granite and sand. 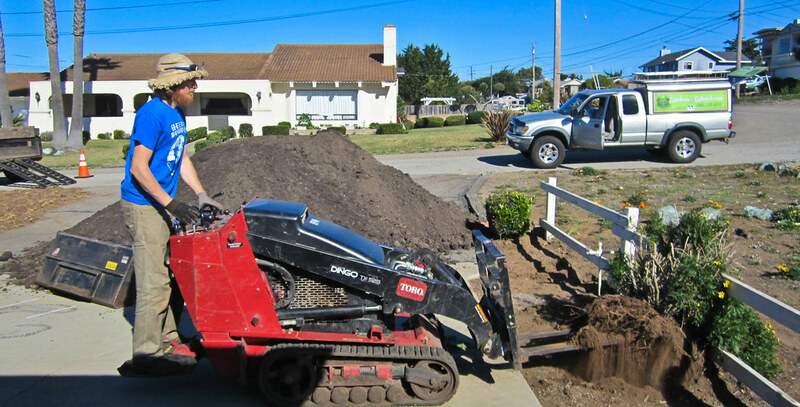 The Dingo comes in handy again for quickly spreading the decomposed granite and Gabe rakes it out. Aside from taking pictures I also wandered around in a daze looking pretty. A smaller path from my front door to the back yard gets the same treatment. That bed used to be filled with Hydrangeas and Aucuba. Gross! The Hydrangeas were moved to the backyard. The Aucuba went to the compost. I do not fancy them. A layer of DG put down. Those are the control valves for zones 3 and 4. One will be for moisture loving shade plants. The other for dry, sunny, natives and annuals. OK I didn’t just wander around taking pictures and looking pretty. I moved some climbing roses from my backyards chain link fence to this white wooden fence. I think they are going to look so pretty rambling along it. Anyone who is gardening with rocky clay soil is going to hate me. My soil is so sandy and easy to work with I was able to pop the roses right out and dig a huge hole for this one in less than a minute. It will need plenty of compost to amend it but it is such a dream to work with. My first garden I pretty much had to dig out a fifty pound boulder every time I wanted to plant a 4″ annual so this is a welcome change. We spent ten hours working in the garden. 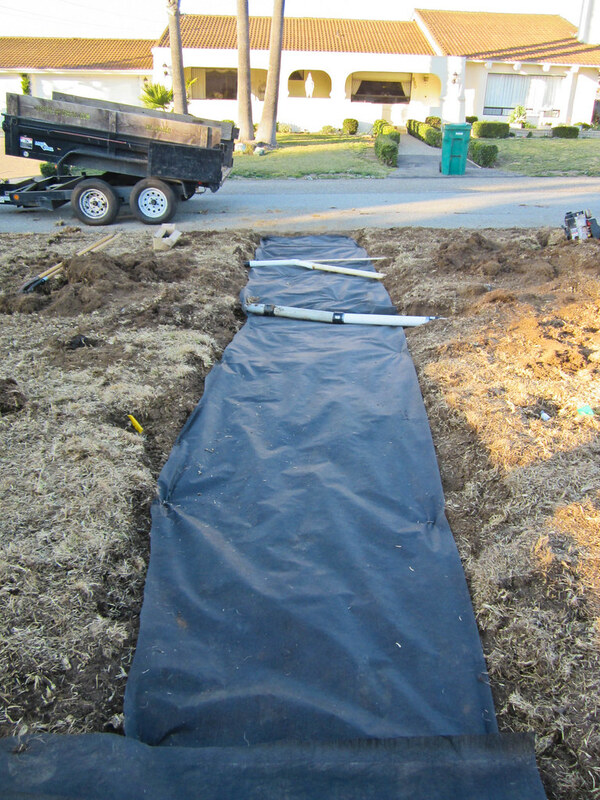 The irrigation and fixing the drainage was so time consuming we didn’t finish. This is what it looked like the next day. The paths are ready for their pavers, the irrigation is converted, the drainage will hopefully keep my driveway flood free, and a lot of old shrubs were removed. 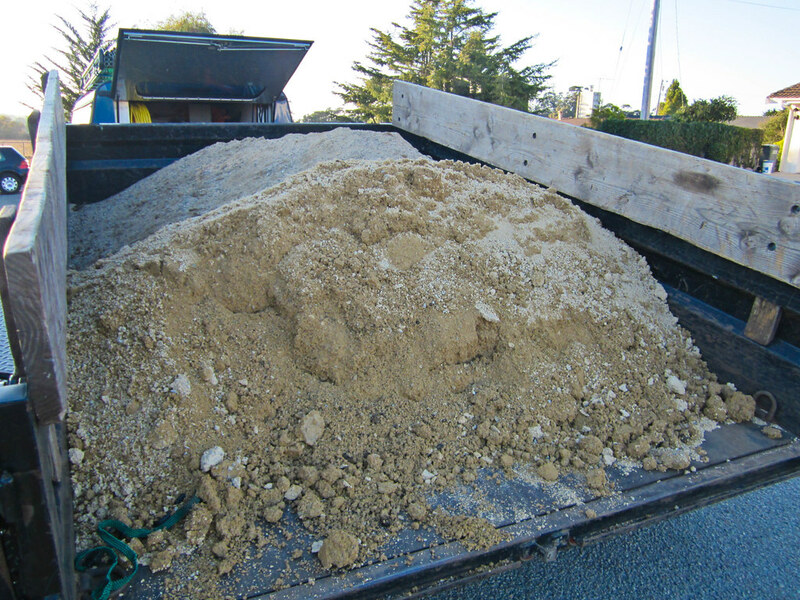 Clumps of grass and old soil were piled up to create berms and some compost has been piled up on top of them. 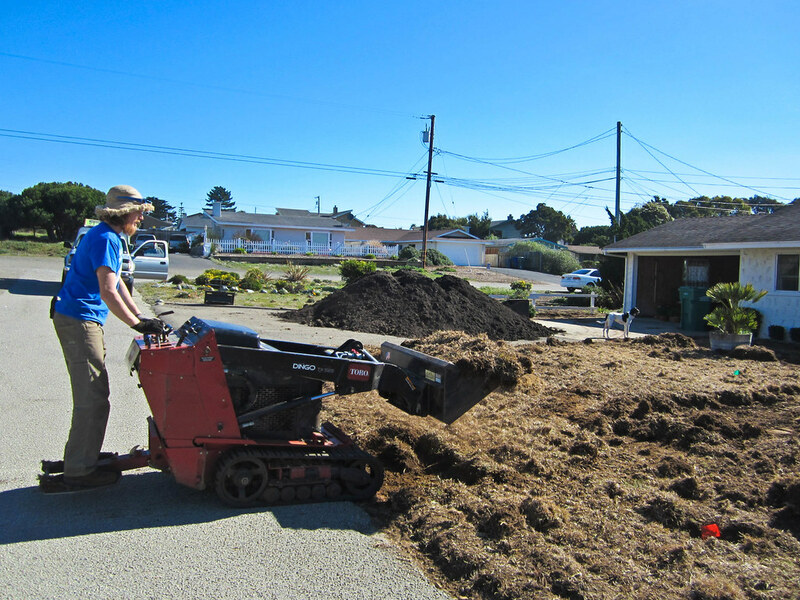 This Saturday we’ll lay out the pavers and add some other finishing touches like spreading out the rest of the compost into berms and rake it out nicely in preparation for the plants. It doesn’t look like much now so you will have to use your imagination. And speaking of plants I thought it was important I had some on hand so I would be ready to plant as soon as we are done with the prep work. So I took a trip down to wholesaler Native Sons in Arroyo Grande. Even though they are not open for retail customers their website is worth checking out if you are a gardener in California. 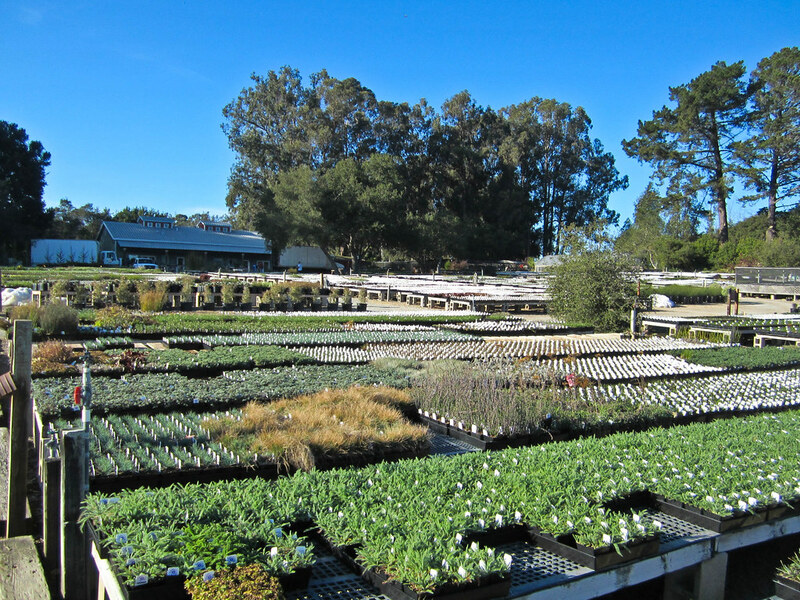 Many nurseries from north, central, and southern California carry their plants. If you see something you are lusting after maybe your local nursery can place an order for you. They have a great selection of native and other mediterranean climate plants for California gardens. I came home with three and a half flats of plants! The big Cantua buxifolia on the right is from Farm Supply Company in San Luis Obispo. Another great local resource for me to shop in. So the rest of the work should be finished on Saturday and then I’ll get planting right away. So look for updates on the rest of the garden building next week and hopefully pictures of a beautiful blooming garden aren’t too far in the future. 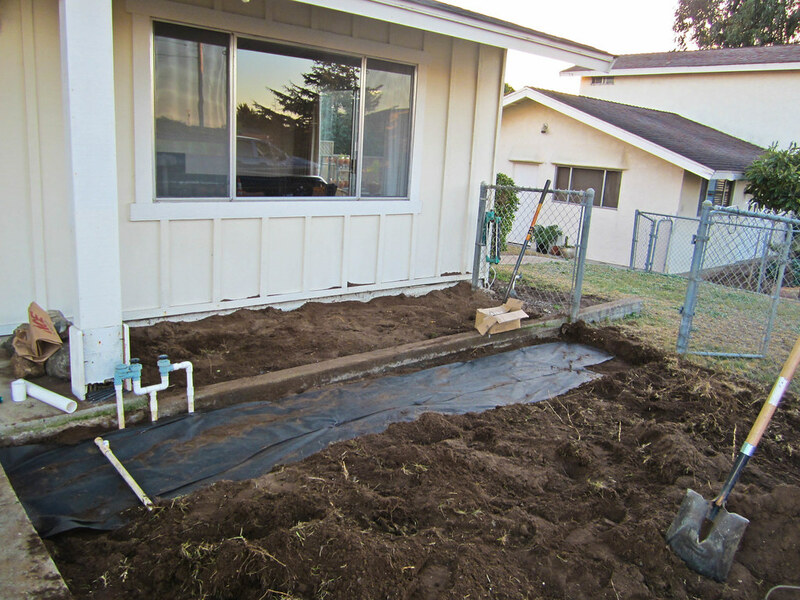 This entry was posted in California, Garden Design, Los Osos and tagged Building My Garden, drainage, garden, garden design, garden installation, Gardens by, hardscaping, irrigation, kikuyu grass, lawn removal, Los Osos, machinery, Native Sons, San Luis Obispo Landscape Design, tilling by entire leaves. Bookmark the permalink. This is great!!! How incredibly gratifying to build a garden entirely to your liking! I’ll be following your progress, for sure! Your story about using the tiller had me laughing at the memory of the day my husband finished tilling our front yard, he could barely move he was so exhausted but finally got the machine loaded in the car to take it back to the rental place when one of our neighbors walks up and says, “hey, before you return that do you think you could come over and do my yard too?” you can guess what he said. Such exciting progress! Is your landlady excited about the transformation? Thanks SHBG. I can’t wait to be able to show pictures of blooming plants! 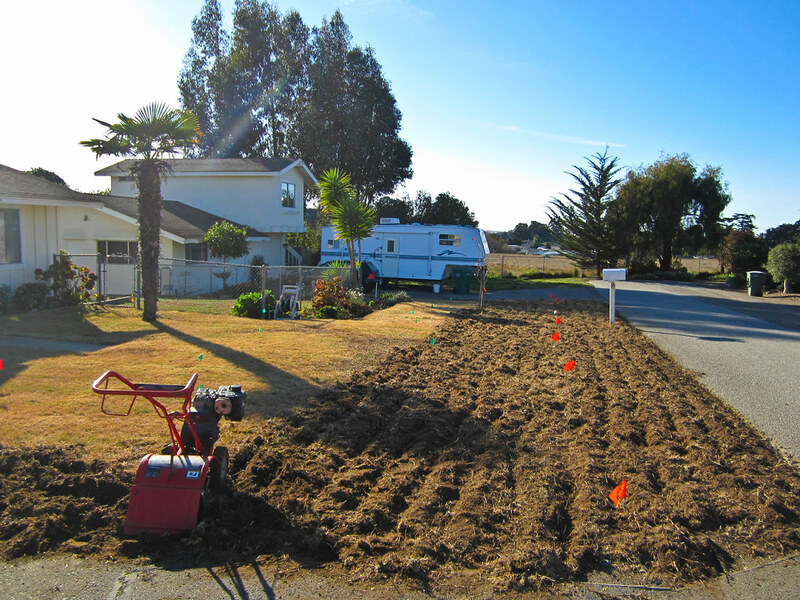 Loree would you believe that I tilled again today? I felt like I didn’t do a good enough job in some parts so it was worth going back again and redoing the parts that aren’t already covered in compost. I realized that the long runners of the kikuyu grass were wrapped around the tines and probably contributing to my difficulties. I cleaned it up and it was a bit easier and I don’t feel as beat up. I’m glad I did it but this time I really mean it. Once that thing goes back on Gabe’s truck I never want to see it again! I am having a vicarious thrill watching the garden develop. It looks great and so different from what I can do here in NH. It is pretty different than what I had in NJ too so hopefully I am able to come up with a nice design. It is way easier designing for other people. I want ALL the plants for my garden so I am having a hard time coming up with a theme.